Later in the spin room, an NBC correspondent — not clearly identified but sounding like Hallie Jackson — repeated the question. As video from NBC shows, this reporter asked only one question as Trump made his way through a line of reporters, and she chose as her only contribution to the post-debate discussion: “Will you accept the outcome of the election?” Trump responded, “Oh yes, absolutely. I will.” They wanted Trump to urge his supporters to reject the election results and cause widespread chaos — to sound like a Nicolás Maduro or some other caudillo, a big theme in the Never Trump movement. They wanted to plant a meme that Trump may encourage a violent coup, even a civil war — so they can blame him for any more violence against his supporters. However, Trump quickly shut it down, with an “absolute” yes — even when they tried to fish for a gaffe a second time. 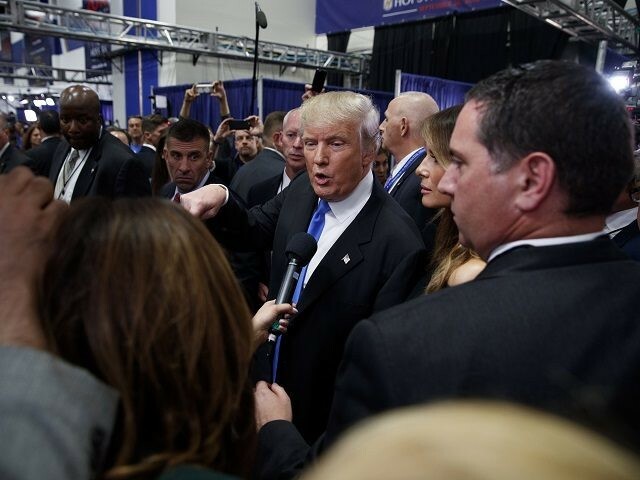 One of the most jarring moments from the first presidential debate Monday night was a closing question about “accepting the outcome of the election” — which NBC News asked Republican candidate Donald Trump a second time in the spin room. During the debate, Trump said he “absolutely” would accept a Hillary Clinton electoral victory. So why ask it again — when the first time was already a weird red herring? HOLT: Mr. Trump, very quickly, same question. Will you accept the outcome as the will of the voters? TRUMP: I want to make America great again. We are a nation that is seriously troubled. We’re losing our jobs. People are pouring into our country. The other day, we were deporting 800 people. And perhaps they passed the wrong button, they pressed the wrong button, or perhaps worse than that, it was corruption, but these people that we were going to deport for good reason ended up becoming citizens. Ended up becoming citizens. And it was 800. And now it turns out it might be 1,800, and they don’t even know. HOLT: Will you accept the outcome of the election? TRUMP: Look, here’s the story. I want to make America great again. I’m going to be able to do it. I don’t believe Hillary will. The answer is, if she wins, I will absolutely support her. The odd emergence of this topic calls to mind the 2012 election, when ABC News anchor and former Clinton White House employee George Stephanopoulos bizarrely raised the topic of birth control during a Republican primary debate, baffling then-candidate Mitt Romney. That issue became a line of attack for President Obama’s reelection campaign, fueling speculation of collusion between the White House and the establishment media. It also brings back memories of the first Republican debate in 2015, where moderator Bret Baier opened by asking the candidates to pledge their support to whoever won the primary race. Trump was the only person on stage who raised his hand to avoid that commitment. Perhaps NBC’s producers were hoping for a similar contrarian moment on a no-brainer unity question. They wanted Trump to urge his supporters to reject the election results and cause widespread chaos — to sound like a Nicolás Maduro or some other caudillo, a big theme in the Never Trump movement. They wanted to plant a meme that Trump may encourage a violent coup, even a civil war — so they can blame him for any more violence against his supporters. However, Trump quickly shut it down, with an “absolute” yes — even when they tried to fish for a gaffe a second time. That second time obviously won’t be the last we hear of this silly question. Much like the 2012 birth control narrative and repeated questions about David Duke, the establishment media will keep bringing up this topic until they get an answer that helps their preferred candidate. As I watched the debate aftermath last night, one moment was especially saddening. A member of CNN’s debate focus group said she was disappointed that the candidates did not discuss substantive issues; the one she wanted to hear about most was health care. If the post-debate spin room questions were any indication, “professional” journalists will continue to disappoint her for quite a long time.